Drop forging production equipments include all production equipments involved during the forging, heat treatment and surface treatment process. These production equipments include: forging press, air hammer, ring rolls, punching machine, heat treatment furnace, shot blasting equipments. Below are the detailed description for production equipments that be used during drop forging process in CFS Forge. Closed forging press is a mechanical press machine forging hot metal into net shape. Under the fuction of forging press,we will achieve high production efficiency and good dimension accuracy. Currently, our factory is equipped with 10sets closed forging presses with different tons (300t, 400t, 630t, 1250t, 1600t, 2500t) to meet various demands. Double disk friction press is a common friction press with usage of forging, extrusion, cutting, bending, correction for ferrous and black metals. It is mainly take use of friction disc and the flywheel to pass power. Air hammer is also a indispensable equipment to make drop forgings. There are two cylinders in the air hammer, compression cylinder and work cylinder. The compression cylinder will compress air and deliver it to the work cylinder by distributing valve, then move the pistion and hammer head to work up and down. 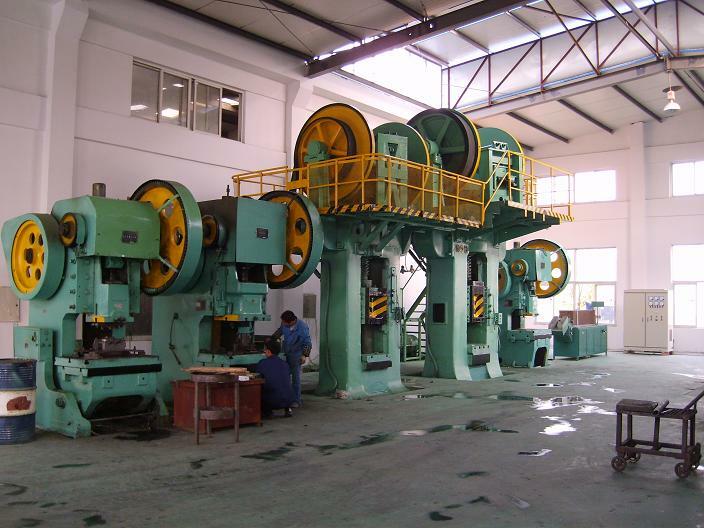 Ring rolls machine is used to make round products like forged flange, forged ring, ect. It will drill the heated round bar to be oblate. Punching machine is served for cutting trimming. After forging the metal bars by forging press, we will see trimming around the drop forging blanks. So punching machine will cutting the trimming in very short time one by one. Medium frequency induction heating furnace is a heating furnace used to heating steel round bars, so that it could be drop forged easily. Heat treating furnaces are used to heat treat all kinds of drop forgings to meet the required mechnical properties. Classifications: bell-type heat trement furnace (specially used for tempering purpose of thin thickness steel plates, roller hearth heat treating furnace (widely used for hardening, tempering, annealing and normalizing treatment), meshbelt furnace (widely used for hardening, tempering, annealing and normalizing treatment), etc. They are used to clear (such as clearing surface sand stickers and the oxide skin) and strengthen properties of drop forging surface. Shot blasting process is mainly used for simple structure drop forging to clear, especially strengthen the hardness or mechnical properties of the drop forgings; Sand blasting process usually used for cleaning the drop forgings with complex structure. Usually used blasting machines are drum-type blasting machines, scraping belt type blasting machines, turntable type blasting machines, car bottom type blasting equipments, squirrel cage type blasting equipment, and suspended ring type blasting equipments.